Insulating a Summerhouse is the best way to ensure maximum usage, whatever the season. Handi-Foam is an ideal insulation product which, allows you to keep cool during the summer and warm and snug during the winter. 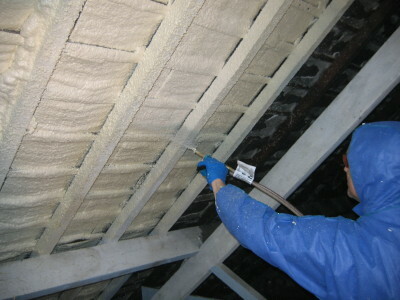 Insulation is traditionally thought of as a winter necessity, however it is just as essential in summer to keep out the heat, and insulation also allows airconditioners (where fitted) to operate more efficiently. 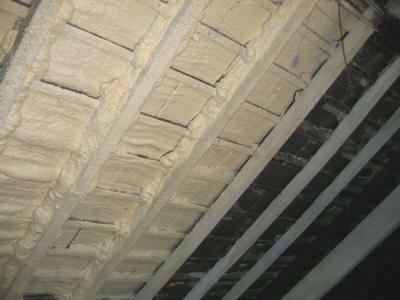 Why would I want to Insulate for Summer? Most roofing materials absorb significant amounts of heat in direct sunlight. The roof then acts like a radiator and transmits heat into the summer house making the room progressively hotter. With summers in the UK getting warmer, it is becoming necessary to reduce the amount of heat transmission into the summer house. Handi Foam is a spray applied polyurethane foam suitable for the DIY enthusiast, and can be sprayed onto the underside of the roof, where it significantly reduces the amount of heat transferred into the room. This makes the summerhouse more temperate on hot days, when the summer house might otherwise be unbearably hot. After all, you want a summer house, not a sauna! 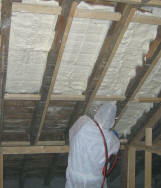 This layer of spray foam insulation has a twofold benefit as it also keeps you warm in winter, by preventing precious heat loss on cold days. How easy is it to Insulate my Summerhouse? Most summer houses are erected as DIY projects - so can they be insulated by a DIY enthusiast? Of course you can - Handi Foam spray foam kits provide the perfect DIY answer! Follow the links on the left to visit our Products & Prices page and our handy Do-it-yourself page for further information.